I don't think George Jung was a corrupt, sleazy drug smuggler, but, more or less, a young businessman making money to support his family and wild lifestyle. That is what makes Ted Demme's "Blow" different from other drug movies-it does not portray its characters as addicted lowlifes, but as recklessly successful, high powered individuals who simply want to live the American dream. The film is based on the true story of George Jung, whose image went from the average Joe next door, a high-school football star from a small Massachusetts town, to the world's premiere importer of cocaine from Colombia's Medellin cartel, who once supplied the States with over 85% of the total amount of imported cocaine in the 1970's and 80's. "Blow" is one of the best movies of the year. "Blow" covers a wide range of generations and locations, ranging from the turbulent 60's to the haze of the 80's, and from such areas of the North America like Massachusetts, Florida, Colombia, California, Mexico, New York and Illinois. The time and location span provided the filmmakers with a challenge. The film was shot in a variety of locations in Southern California and in Mexico. "It was a difficult film to schedule and shoot because it had so many different time periods. And since it was the story of a man's life, every scene was fairly brief which meant an incredible number of scenes to be shot," explains executive producer Georgia Kacandes. Covering so many years in a single film also tests the ability of the film's costume designers and makeup artists. The wardrobes, makeup and hair styles appear authentic and impressive. This movie pays close attention to even some of the most minute of details. "Blow" displays a consistent and detailed portrait of the spectacular rise, and dramatic fall, of Jung and his travel towards turning powder cocaine into American's biggest drug problem. Ted Demme's direction is vivid, determined, and stylish. He reportedly conducted many interviews with the real life George Jung, as he makes very clear the early high life, and the dangerous reality of a drug smuggler's everyday lifestyle. Demme is careful to stay away from frequent potential distractions, like the drug use, side characters, family issues, and romantic interests. This is a vivid narrative of a very interesting character. It does display a message about drugs that we have seen before, but never in this stylishly innovative light. Laced with amusing detail and probing awareness, "Blow" defies the usual road of drug movies and provides us with tension and interest from Jung's many experiences-risky border crossings, ferocious consultation, unexpected deception, the persistence of the authorities, and unconquerable temptations. But untimely the film shows the true tragedy of losing your dreams to greed and drugs. Johnny Depp proves once again what a triumphant, adaptable actor he can be. 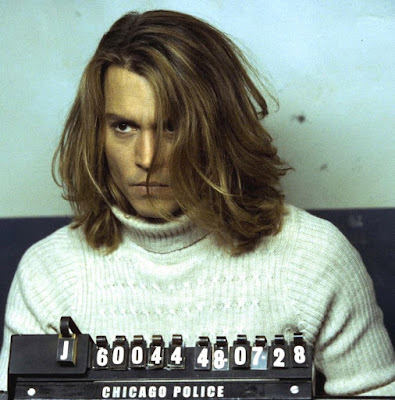 He portrays George Jung with the perfect amount of greed, style, confusion, pride, and desperation. The real George Jung is in a prison cell in New York. Without possibility of parole, Jung's release date is scheduled for 2015. Depp acknowledged the responsibility that comes with dramatizing a true individual, but also the responsibility of the director. "I knew Ted was committed to the film, but I didn't understand how deeply committed he was to the real George." "Blow" becomes one of the most intriguing movies of 2001, but it even suffers in comparison to the incomprehensible achievement director Darren Aronofsky accomplished last year with his disturbingly real display of the downward spiral of four drug addicts in "Requiem for a Dream." That film gave us a cinematic taste of what drug addicts experience through their addictions and depravity. "Blow" still shines a fresh new light on drugs in movies, and perceptively portrays the story of a person from whom many can learn. This is based on the Stephen King short story called "Secret Window, Secret Garden". It is about Mort Rainey, a mystery writer who had recently divorced his wife because she has cheated on him. He is struggling with the loss and lives in a cabin on lake with his beloved dog. The movie begins with him taking a nap (he does that a lot in this movie) when he hears a knock on the door, at the door there is a man blaming him of plagiarism. He soon finds out that this man,John Shooter, is very serious about the story situation, he find s his beloved dog dead, along with a few other people. Who is this John Shooter? Does he even exist? Is Mort just plain crazy? Find the answer to all of these questions in this drama/thriller. The violence in this film is scarce but pretty graphic. The language is constant, but since it is PG-13 there is only one use of the F-word, with many used of the S-word. The sexual content is the basis of the movie. Overall i love this movie and recommend it to anyone, though some may find it boring. 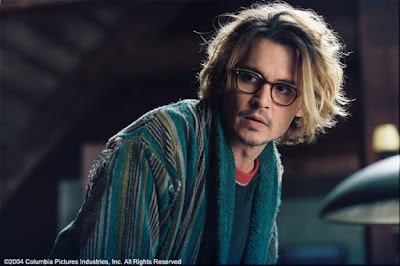 "Secret Window" is another one of those eerie thrillers where danger lurks within the shadows. We can almost feel it, and so can the hero, as he walks through his house, armed with a weapon, ready to defend himself at all costs. He hears a noise from somewhere behind him, spins around, and suddenly realizes it was just his imagination. He sighs, puts down the weapon, turns around, and BOO! There's the bad guy, who has somehow managed to enter the locked home and avoid being detected. What if, I wonder, one of these times, the bad guy was seen as he entered? What if the Fisherman from "I Know What You Did Last Summer" had been spotted, and confronted, by one of the teenagers? What if Norman Bates' "Mother" had been exposed from the start? Then there presumably would be no movie, of course. Koepp, who wrote the screenplay for the film, realizes that the key to the story is Depp's performance wisely allows his primary actor to let loose. Meanwhile the co-stars all deliver fine, convincing performances and although the grand finale is a bit of a let-down, and terribly predictable, the movie's style is interesting. "Secret Window" is better than most in its genre, although by no means is it a masterpiece of any sort. Just an enjoyable Friday/Saturday night matinée, and worthy of recommendation if you're not looking for anything special. Tim Burton is just about as good as they get in the movie business when it comes to creating an atmospheric world to inhabit specific characters. "Sleepy Hollow" is the perfect kind of movie for his directional Midas touch; it resembles the best of Burton in every way. In the film, an adaptation based on a story by Washington Irving called The Legend of Sleepy Hollow, he captures the slumbering, creepy village of Sleepy Hollow with vivid details and imaginative description. The way everything is presented, the trees look like something out of a fairy tale and the scenery represents deception in a mysterious wonderland, is what makes this production one of the years most captivating and magical film experiences. Some of the visual credit should also be given to the film's Cinematographer, Emmanuel Lubezki, and the credited production designer, Rick Heinrichs. These elements contribute a great deal of success to Burton's masterpiece. Both the design and Cinematography are some of the best seen all year, and deserve a hard earned Oscar Nomination. They make the film intriguing and visually stimulating. The film takes place in the late 1700's, in New York. Constable Ichabod Crane, a timid and but smart man played by Johnny Depp, is assigned to investigate a series of grizzly murders in a nearby town called Sleepy Hollow. He's rather concerned about his latest task, however, due to the content of the killings. The victim's heads have been sliced, in one clean sweep, straight from their bodies. He accepts his duties, and travels by horse and carriage to the isolated village. Once Ichabod arrives, the locals, including Lady Van Tassel (Miranda Richardson), Baltus Van Tassel (Michael Gambon), Brom Van Brunt (Casper Van Dien), and Reverend Steenwyck (Jeffrey Jones), greet him with eagerness. They explain the legend of the headless horseman, who is supposedly causing the murders in their town. At first he is skeptical. Then, after witnessing a victim losing their head personally, he arrives at the conclusion that a headless horseman is responsible for the tragic catastrophes accruing. Ichabod soon meets Katrina Van Tassel, an innocent looking, self spoken young woman who may have some advice, as well as several secrets of her own. The Headless horseman is a perfect portrayed villain for "Sleepy Hollow." He is brute, oversized, and roughly textured with outwear. The actor who brings him to life when his head is on is perfect for the role; Christopher Walken. For some odd reason, however, popular film critic Roger Ebert reluctantly refused to tell his readers the name of the actor, thinking it would give something away. Well, I am sorry, Mr. Ebert, but it isn't that hard to find this information elsewhere. The filmmakers are not trying to hold Walken as a secret. Stating he stars as the headed horseman gives nothing away. One must see his performance and make up for themselves to even imagine what material the film's bad guy brings forth. Tim Burton's direction is focused and wonderfully observant here. The murder sequences are gory and violent, but never way over the top. Burton never losses sight of his main characters, has a good idea about what he wants to place in film, and the special effects do not distract his ability to do so. He has a knack for allowing an audience to become involved with his pictures. We must think for ourselves, figuring out nuggets of the plot on our own, without the projectors help. He has demonstrated these techniques before in such films as "Edward Scissorhands," "The Nightmare Before Christmas," and even the best Batman film yet, "Batman Returns." 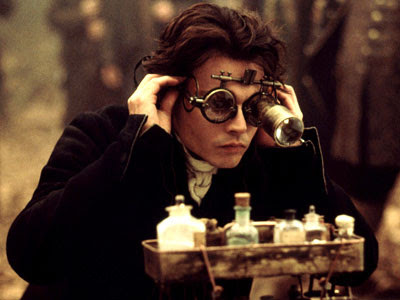 Johnny Depp offers an Oscar worthy performance as Ichabod Crane. He brings the squeamish role to life effortlessly with striking details and perfect form. He is flawlessly cast, as well as Christina Ricci, who also acts with style and poignancy. Compliments also go out to splendid costuming the actors are permitted to wear. Although "Sleepy Hollow" offers lots of creepy impressions, the film is far from being very scary. Some moments do generate some minor thrills, but for the most part, the production is not as terrifying as it could have been. Much of it lacks momentum and build-up for the dozen or so graphic beheadings that take place. Burton could have easily loaded his picture with bombarding amounts of shock value, suspense, and tension filled fright, but instead goes for all out violence, plot, and mystery. Not that this effects the overall production. This is more of an atmospheric movie than a scream feast. The atmosphere is certainly above the average. The conclusion of "Sleepy Hollow" works in a bizarre, but unpredictable fashion. The climax occurs unexpectedly and excitingly, with much surprise and special effects. The film's foreshadowing is effective, but regardless of how experienced of a filmgoer you are, this is one ending that is not meant to be figured out before it takes place. It is one of the preferred closings I've seen in a while. Despite a few personal objections, "Sleepy Hollow" is a brilliantly crafted work of art--one of the years better films.